Black Ops 4 will have at least four remastered maps from the series’ past at launch, with Nuketown joining the lineup a month later. Treyarch hosted a livestream earlier today (which you can watch in full below) dedicated to the game’s multiplayer, revealing the return of those maps plus the brand-new location, Frequency. Frequency is set in the Hunan province of China, on a large listening station built into a jungle cliff. There’s always a chance of falling to your death when you’re outside with lateral paths throughout, but the interior promises lots of action and fast-paced combat with plenty of chokepoints. Frequency – along with the previously revealed maps Contraband, Seaside, and Payload – will all be shown in playable form at E3 next week. Call of Duty has always been one of the gold standards for shooters – will Black Ops 4 be one of the best FPS games on PC? The four returning Black Ops maps are Jungle, Slums, Summit, and Firing Range. They’re all being redesigned with new visuals and further enhancements, though it remains to be seen how extensive those changes will be. 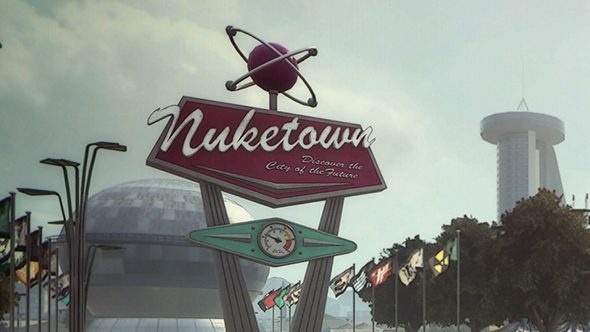 Those maps will all be in the game at launch, but the fan-favourite Nuketown will make a stylishly late debut in November. There’s no indication that the close-quarters map will be a pre-order bonus as it has been in the past, so it looks like this update will be a truly free one. We know that more classic Black Ops maps – or at least pieces of them – will show up as part of the battle royale Blackout mode, though we’ve yet to see how that will look or much about the mode at all. Hopefully we’ll see more at E3, alongside a closer look at the new multiplayer maps.